Over the last several years, Clarity has grown in big ways. We’ve evolved from a one-person shop in our early start-up days, to a team of many — consulting on a diversity of projects. Our still-small but-mighty team of engineers and technical leads provides insights, solutions, and results every day. We’re exceptionally proud of the innovations we drive and the mission we fulfill. Women are integral to our growing team. In the last three years, they have made up 33% of our new hires — a number we are working to build upon. In this edition of our Latest News, we’re introducing some of the women at Clarity. Vital to our team, they are advancing all areas of our business. Their tech career journeys speak of creativity, problem solving skills, a desire to contribute to the big picture, and the determination to never stop learning. DIANE CRAFT, PRINCIPAL SOFTWARE ENGINEER,GUI EXPERT“My best friend and her dad pushed me towards college. I was the first in my family to go.”Diane enjoys working in a fast-paced environment where deadlines are a way of life. “What we’re doing is really cool and exciting,” she says of her team’s project. With more than 20 years of software development experience, Diane’s ever-growing technical skills include fluency in an impressive array of applications, languages, databases, platforms, frameworks, and standards. As a front-end developer, Diane knows that user experience is critical. She applies her technical skills to ensure smooth and intuitive interfaces and gets great satisfaction receiving positive feedback from clients. Hearing: “I love how this works,” makes Diane most happy about what she does. It wasn’t always about software development. “I wanted to be a National Geographic photographer,” Diane admits of her childhood dreams. “We had National Geographicsubscriptions, so I’d flip through the magazines. I asked my parents for cameras. I knew that’s what I wanted to do.” Before college, aptitude tests led Diane to Computer Science. She had a knack for math and saw the success of her cousins who were working in CS. Diane decided a technical path would be worth pursuing. During her college years, she worked fulltime as a junior programmer to pay her tuition and fees. APRIL DEPETRIS, SENIOR DATABASE ENGINEER,PROFESSIONAL PROBLEM SOLVER“Because I had good grades, they put me in programming class, and I did well.”With a can-do attitude, April takes on the critical challenge of administering two databases. She manages these behemoths for growth, query efficiency, changing requirements, backups, and more. Creation, migration, and building make up just part of her technical toolbox. April gains immense satisfaction from solving problems, and she takes on the challenges of database engineering with flexibility and determination every day. “I like to build stuff,” she explains. As a young girl, April enjoyed art and making things with her hands. She worked on circuit boards, Erector Sets, and Lincoln Logs. When she was scheduled to take an elective high school sewing class, April drew a line, telling her mom she didn’t like sewing at all. Instead, the school cautiously placed her in a basic programming class. She was considered too young to master the material, but April thrived in the world of programming and resolved to pursue more technical courses. At UMBC, Computer Science was a natural fit. “I got my first IBM when I got to college,” April recalls. From there, she didn’t turn back, accepting her first development job when Visa’s Owings Mills office launched its development department. RACHEL GREENIER, CORPORATE ADMINISTRATOR,GUIDING LIGHT“I use my psychology degree every day for HR and much more.”Rachel proved herself an essential Clarity resource even before officially signing on in 2011. Throughout the years, she has been willing to pitch in wherever necessary by seeking the training needed to get the job done. 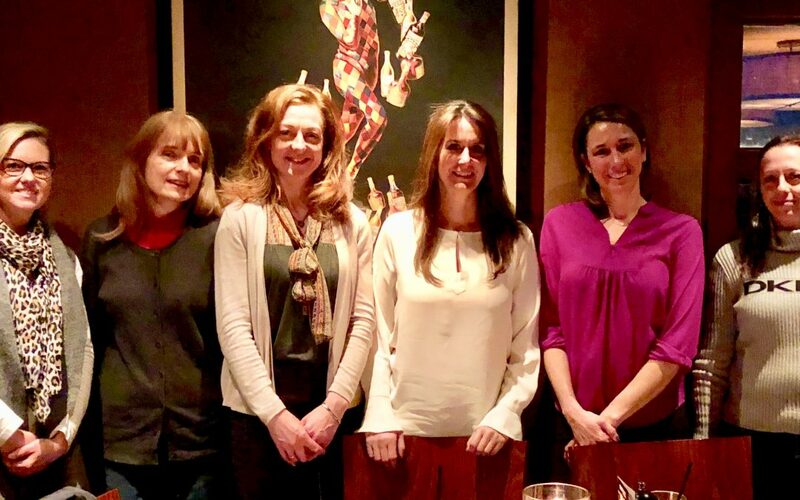 Rachel handles Clarity’s human resource matters, health care benefits, security requirements, accounting, purchasing, company outings, and the much-anticipated annual holiday party. As TJ’s closest advisor in this small business adventure, in countless ways, she has served as a guiding light through periods of growth and change. Everyone at Clarity relies on Rachel for help with any number of administrative matters. With ceaseless adaptability and a positive attitude, she takes care of our team so that our technical work stays in focus. She wanted to be a teacher. A graduate of Frostburg State University, Rachel originally went to college to specialize in Early Childhood Education. Realizing she preferred Psychology, she switched majors and has since enjoyed practicing the skills she learned in earning her degree. Psychology has been fundamental to Rachel’s role at Clarity, in raising her kids, and as a children’s ski coach for more than 20 years. Terri has more than 20 years of experience in software development and related fields. She has designed and implemented a variety of applications, programmed in a range of in-demand languages, and developed data models for diverse document collections to support information retrieval and presentation. Her management experience includes leading technical staff and delivering products. Terri is a lecturer with the Engineering Program for Professionals at Johns Hopkins University, teaching the online course, “Biological Databases and Database Tools,” and serving as a faculty advisor for student projects. With her development career well established — because the subject matter intrigued her — in recent years, she pursued and earned a MS in Applied Molecular Biology. Terri also holds a MS and a PMC in Computer Science. Terri encourages people to consider software development even if they don’t have a passion for math. When she chose an area of study in college, Terri became interested in Computer Science. “I wanted to go to a liberal arts college,” she says. “I liked science, but I didn’t like doing labs.” She liked math too, but didn’t want to be a math major. Computer Science had the right mix of topics and skills needed. Since then, Terri’s career has focused primarily on handling data, requiring very little of the math she learned in college. Bethany serves as Clarity’s Operations Manager. She works closely with the Leadership Team to ensure that day-to-day activities run smoothly and efficiently. She leads company outreach and tech community involvement; works closely with customers, employees, and candidates to assess industry needs and company opportunities; and helps handle human relations, contractual relationships, recruiting, event planning, and marketing. In a nutshell, Bethany helps run all areas of Clarity’s operations and growth. Her enthusiastic involvement and impact on our success is felt every day as the Leadership Team navigates opportunities and challenges. Her professional journey began with an interest in international travel. “I wanted to travel the world on other people’s money, so I went into International Business,” Bethany reveals. At a liberal arts college where she focused on business classes, concentrating in Marketing and International Business, Bethany enjoyed the well-rounded nature of her studies. A native of Brooklyn, New York, she launched her career in New York City, working in recruitment and development at an international law firm. When life brought her south to Maryland, Bethany worked at law firms in Washington, DC, before migrating to our region’s burgeoning tech industry. GINA SHANEY, SOFTWARE ENGINEER,DEVELOPMENT ENTHUSIAST“I like learning new things and finding solutions.”Gina has over 20 years of programming and operations support and leadership experience in the commercial sector. For the last eight-plus years, she has worked on government projects in a software engineering and testing capacity. Her technical expertise is always growing, and she has pursued training opportunities and been enthusiastic about picking up new skills along the way. Known for her customer- and mission-focused approach, Gina is quick to credit others and thankful for the teams and leaders she’s worked with. “There have been a few people who have been very helpful in my development growth,” she explains. Excellent communications skills have made Gina a real asset to the teams she has been part of. Her favorite subject in school was math, and she liked solving problems. But, when she was little, Gina wanted to be a psychiatrist. In the end, she knew that Computer Science was important to our future, so she studied data processing in college before embarking on a career that soon introduced her to programming, analysis, information systems management, and testing. Today, she is enjoying her software development role and still seeking opportunities to learn. SHERRI TEARMAN, SENIOR TEST ENGINEER,CONSUMMATE COMMUNICATOR“Try to listen to your heart. Don’t put too much pressure on yourself at a young age to figure out exactly what you want to do.”Sherri Tearman has happily dedicated over 20 years of her career to providing support to government customers. She has contributed to a variety of projects and programs, working in functional testing, usability testing, quality control, instructional design, web design, stakeholder outreach, and user and documentation support. As a Senior Test Engineer, her keen attention to detail and unmatched communication skills provide immense value to her team and the users of the software that it is developing. “I was so excited to be accepted into the School of Engineering at University of Maryland,” Sherri says of her college years. She had taken aptitude tests that steered her towards the field. Less than two years into her coursework, Sherri took a leap of faith and moved on to pursue a degree in Fashion Merchandising and Child Development. Disenchanted by a short career in retail, Sherri looked for opportunities and pivoted to a job with a consulting firm that had IT clients. Before long, she trained and joined one of their technology teams. Today she most enjoys helping people and contributing to projects that are bringing useful tools and products to life. #CodeWithUs — Are you a creative problem solver who loves to learn and contribute to critical projects? We’re hiring qualified technical women and men. 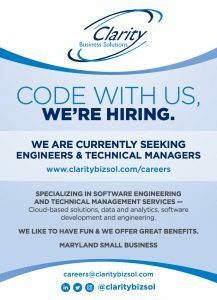 To learn more about joining Clarity’s team, visit our Careers page or send your resume to careers@claritybizsol.com.